Achieve low-cost introduction of source gases such as CBr4 and NH3 for MBE systems with Veeco's Low Temperature Gas Source. This unit features a large conductance tube for fast gas switching and a diffuser end plate for good growth uniformity. It is ideal for source gases that do not require thermal pre-cracking before reaching the substrate. Enhance MBE process flexibility and yield by combining this source on one mounting flange with an Atomic Hydrogen Source or a conical Dopant Source. The Veeco Low Temperature Gas Source for MBE systems provides a low-cost means to introduce a source gas without thermal pre-cracking. The source features a large conductance tube for fast gas switching and a diffuser end plate for good growth uniformity. With advanced flux modeling, the end plate hole pattern is customized to the specific MBE system for optimal performance. A band heater, external to vacuum, heats the source to a temperature range (< 200°C) sufficient to prevent condensation of the gas in the tube, yet not high enough to promote cracking. To make efficient use of the source ports on an MBE system, this source may be combined on a single mounting flange with the Atomic Hydrogen Source, or a conical Dopant Source. For these combination sources, the gas injector does not include a separate band heater, but rather is heated by the source or hydrogen-cracking filament. MBE growers use a variety of active nitrogen sources for deposition of GaN and other nitride-containing materials. While highly stable N2 source gas must be activated in a plasma, NH3 is sufficiently reactive for deposition even without thermal pre-cracking. 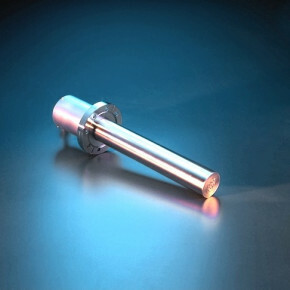 The Low Temperature Gas Source is ideal for injection of NH3 into the growth chamber. The conductance tube is heated sufficiently (<200°C) to prevent condensation without providing any cracking of the source gas. Typical substrate temperatures, in the range of 700–900°C, are sufficient to cause dissociation of the NH3 directly at the substrate.